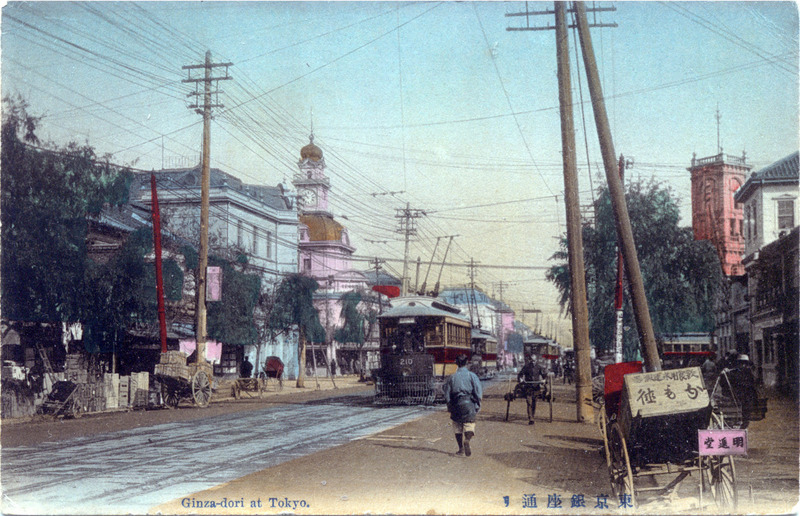 Ginza Crossing, c. 1910, looking west down Harumi-dori toward the Imperial Palace. The Hattori clock tower was the district’s most prominent landmark. “Success did come [to Ginza], but slowly, and by 1894 the Hattori Building at Harumi-dori and Chuo-dori had begun to change the area. Its clock tower became a rendezvous spot, and what had been a newspaper building was now to become a major store of quality products under the name of Wako. The building originally bore the name of Hattori Kintaro, a twenty-two-year-old watchmaker who opened a shop on the Ginza. 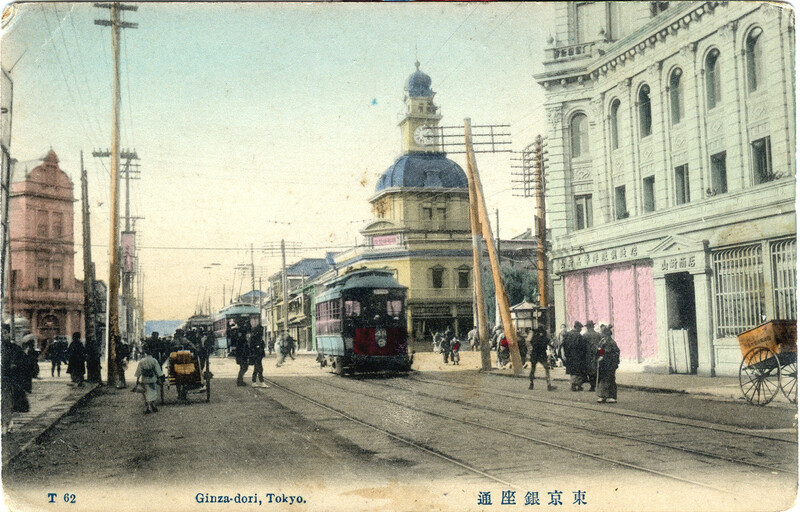 Ginza Crossing, c. 1910. The landmark Hattori building clock tower is at center-left. 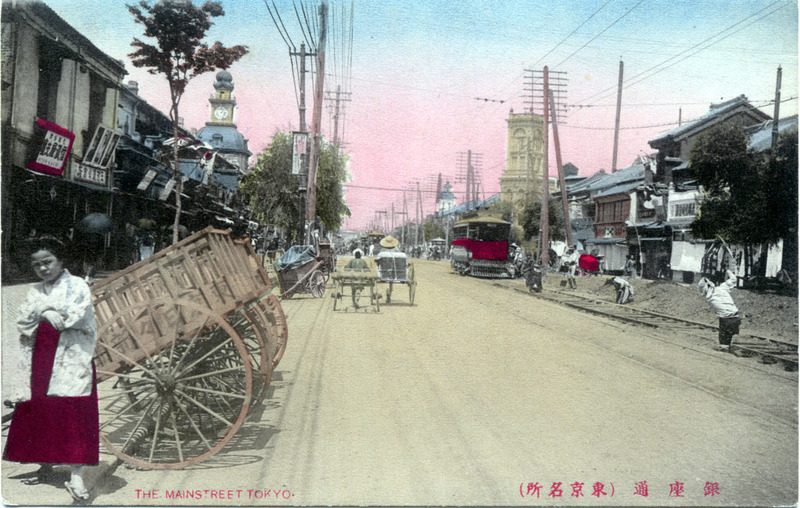 Ginza Crossing, c. 1910, with the Hattori clock tower at center-left. 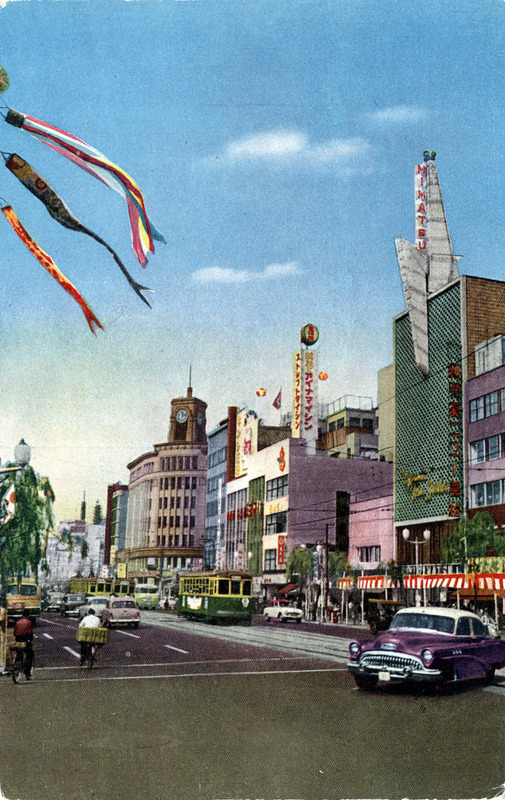 The Wako department store building (with clock tower) at Ginza Crossing, c. 1955. From the wiki: “From 1894 to 1921, the Hattori Clock Tower stood on the site that Wako occupies today. 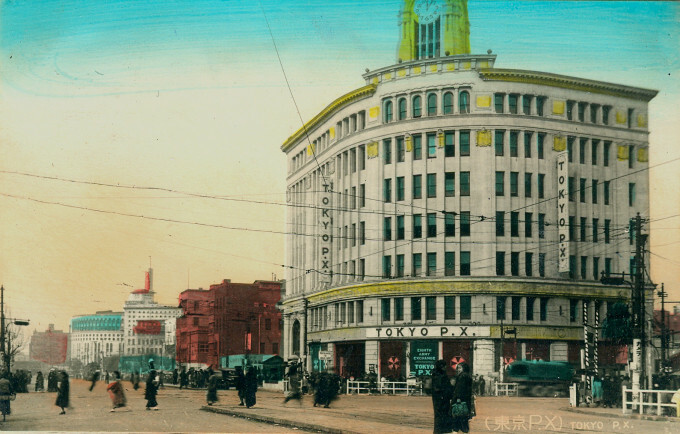 In 1921, the Hattori Clock Tower was demolished to rebuild a new one. Reconstruction was delayed by the Great Kanto earthquake of 1923 but the new tower was completed in 1932. In homage to its predecessor, the new store was also fitted with a clock. “The 1932 Neo-Renaissance style building, designed by Jin Watanabe, with its curved granite façade, remains today as the central landmark for the Ginza district (the clock tower still plays the famous Westminster Chimes) and was one of the few buildings in the area left standing after World War II. During the Occupation (1945-1952), Wako functioned as the Tokyo PX store for Allied occupationaires. 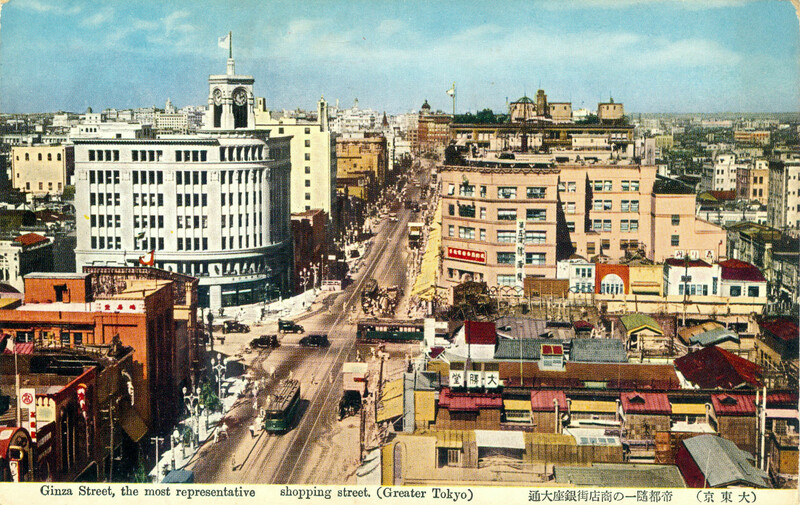 Ginza Crossing, c. 1945, with the Wako Building at upper-center. 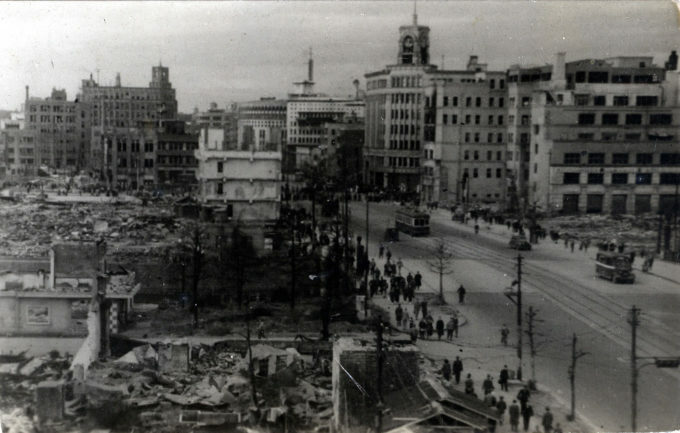 The district suffered great damage during a May 1945 firebombing of Tokyo. In the immediate aftermath of the Pacific War, Ginza remained a burnt-out shell of its former self, but would quickly be rebuilt during the Occupation. 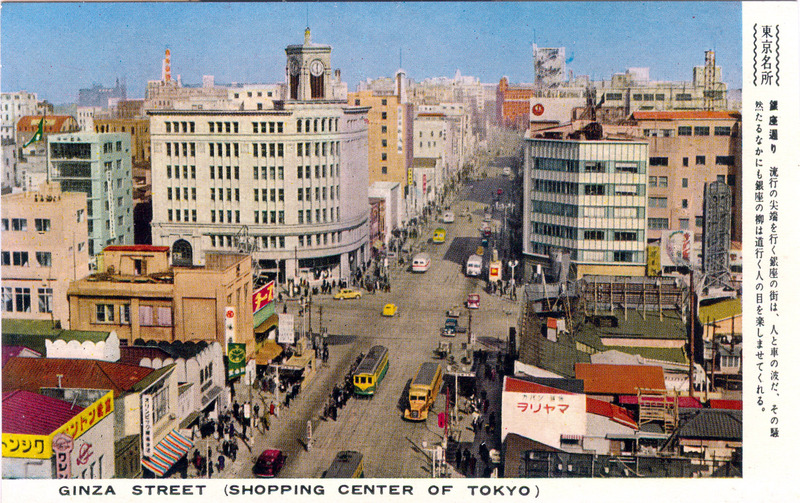 Elevated view of Ginza Crossing, c. 1940, with the Wako building clock tower at left. Elevated view of Ginza Crossing, c. 1960.